M82, is an unusual starburst galaxy in Ursa Major. A member of the M81 group of galaxies, M82 is gravitaionally energized by its recent close encounter with M81. 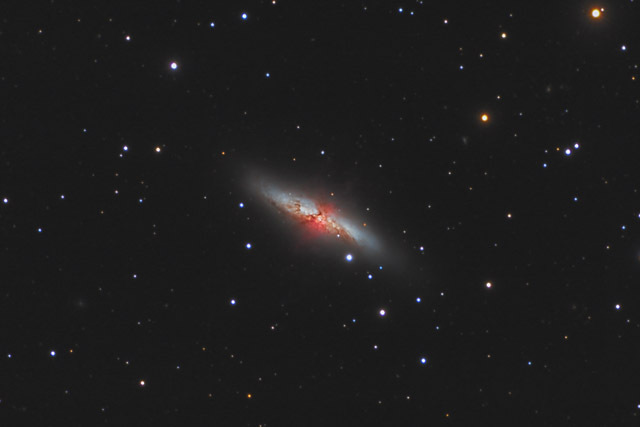 Telescopically, M82 is an easy, bright target with an apparent size of 11' x 4'. Its long, thin shape earns it the nickname of the Cigar Galaxy. In this image, North is up. This image is cropped to 48% of the original full frame. Software Used Images Plus 5.0 for camera control, calibration, stacking, digital development, star shrinking, smoothing and noise reduction, advanced Lucy-Richardson deconvolution, and multiresolution sharpening. Photoshop CS5 used for levels and curves, high pass filter, star shrinking, screen mask invert, lab color, saturation adjustments, selective color, and lens correction. Gradient Xterminator for gradient removal. Carboni Tools for additional noise reduction, and smoothing. HLVG for additional color correction. Focus Magic for focus restoration. Notes I had captured about 8 hours of Ha data to combine with this image. Unfortunately, the Ha data was very noisy, so I decided to process this image without it. Despite the lack of Ha data, I picked up the Ha jets fairly well - not as good as it could have been, though.